The video platform is making easier to find related videos on Android and the web. When you visit YouTube on Android or the web, you might come across something you probably associate more with Twitter or Facebook: hashtags. The video platform now allows uploaders to add hashtags to their descriptions and video titles to make it easier for viewers to find their channels and content. 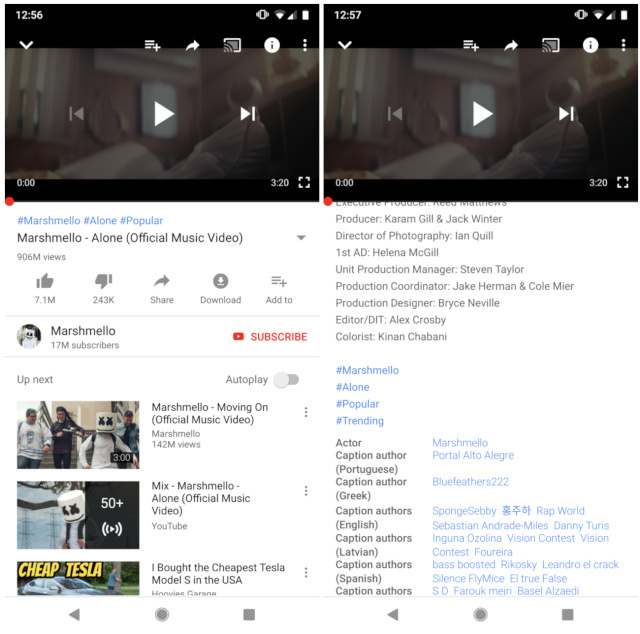 Like in other places on the internet, YouTube's hashtags are clickable and will bring up a results page with other videos tagged with the same thing. The website will even display the top three hashtags at the bottom of the video and above its title. Android Police has spotted Google's support page detailing the rules behind new feature. YouTube's policies prohibit creators from adding misleading tags, as well as those meant to harass or humiliate an individual or a group. Hashtags that promote violence or hatred and anything sexual or explicit are also not allowed on the platform. YouTube says it will pull down videos that violate those policies. We're not seeing any hashtags in both our Android app and the web at the moment, so the feature might still be in the midst of rolling out or available only in the US and other select locations. One thing's for sure, though: it won't be making its way to YouTube's iOS app just yet.